Last night I attended another cooking class at the Culinary Center in downtown Overland Park. Can you guess what we did? It was a hands-on Croissant class. Eileen Usovicz is the owner and baker at Clock Tower Bakery, which is right across from the Culinary Center. Eileen had us began at the end of the croissant making process. Rolling and cutting the croissants was our first task accomplished. It gave enough time for the croissants to proof and bake. (Which means eating and I'm all for that!) We even got to make pain au chocolat....they were heaven. I would have photographed those too.....but Dave ate them last night. The layers and wonderful flavor come from butter of course. A 20 pound square of butter is laid on top of the dough. (I'm kidding, we only used 6 1/2 oz of butter.) Rolling and folding the dough layers the butter throughout the dough. It melts during baking and the results are shown below. My photos could have used more light. Everything here is a bit dark....and I would go and reshoot everything....but I have to confess. I ate one as I worked. Here is the last bite. Here's the last one....but not to fear. I'm sure Dave will make short work of it. We left class last night with a bag of hot croissants and with dough already to cut and make more. What a class! The instructor was so organized that all 30 people were smiling and eager to try this again. Croissants are easy to make. She recommended Williams Sonoma Essentials of Baking cookbook. I will be making these again. The final Anniversaries of the Heart will be ready soon. It will ship to the distributors in 2 1/2 weeks. This pattern will also include the bonus. The Folk Art Museum is hosting a very large quilt show, 650 quilts to be exact. In fact, it's the largest quilt show ever shown in the city. It's from March 25-30th. "Infinite Variety: Three Centuries of Red and White Quilts" will be at the Wade Thompson Drill Hall at the Park Avenue Armory. All this and free too. Hope to see you there!!! The croissants look so good! And the teacher sounds wonderful! I live close enough to the city that I really should be going to that quilt show. But life is so crazy around here right now that I don't see that happening. Sad, huh? I would love to go and bump into you there! Have fun! What a wonderful class...and the final product looks yummy...can almost taste them. Enjoy your NYC trip...can't wait to hear all about it. Yum! The croissants look delish. Have the best time at the quilt show, it sounds wonderful. Enjoy the Q show, should be a real beauty, and we all love freebies, safe journey to you. Hi -- I can almost smell the croissants. Sounds like a fun class. And your trip to New York sounds fabulous. I hope that you will be able to bring back some pictures of at least a few of those 650 red and white quilts to share with your readers. Can't wait to see the last Anniversary design, and the bonus squares. I am almost caught up, as I am doing them all on one piece of fabric. Enjoy your trip. Safe travels. Boy, do those croissants look good. I can almost smell them coming out of the oven. Great news about the final Ann-Heart, not that I am ready and waiting for it. I have gotten seriously side tracked with doing the little projects in your Journey book. Wow, do those look delicious!! I love your baking posts!!! I will be at the show Saturday, can't wait! The croissants look incredible! What a fun class that must have been! I am so looking forward to your final AOTH and bonus design. Enjoy your trip!! Ok, I'm off to find a croissant recipe or order the cookbook you suggested. Definitely want to try my hand at making these! They look delicious - I love pain au chocolate too! They're looking very jammie! It's a lot of work but tasting them must be worth the effort you've put into them! 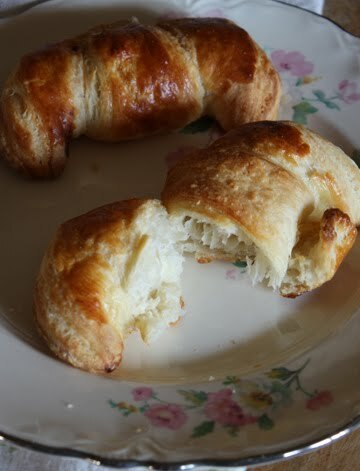 Oh my, the croissants looks yummo! 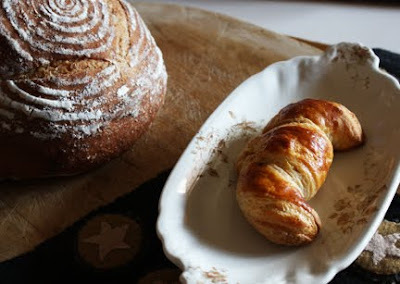 I love to eat anything bread-like and I even bought the "Dough" book for bread you suggested.......a new culinery adventure for me! BTW, "A Stitcher's Journey" is one of the best publications ever....LOVE IT! New York City and Infinite Variety! I hope you have fun, and I hope I see you there. 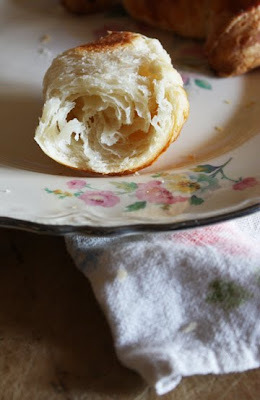 Have a great trip to NYC - croissants look delicious-think i'll try my hand at some-have been loving your adventure into the bread realm....makes me smile every time i read your blog......happy 2nd! I'll be at the show on Monday! I'll wave if I see you. 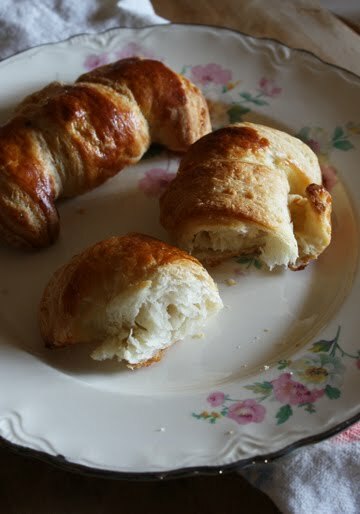 In the meantime, enjoy the lovely croissants! Gosh!!! She stitches, quilts, designs, AND bakes!!!! Looks like a perfect picture!! I'm so envious of anyone going to NY to see the Red & White exhibit!! Have fun, and do report back!! Please. I'll be in NYC by Sat afternoon.. taking the train up from DC!! And I'm VERY envious of you baking... i have not kept my promise to myself lately for new breads to try!!! Thanks for the wonderful post, and the book recommendation. Picked one up the other day, gave it to a good friend who loves to bake, all wrapped up in wonderful paper and a bow... with ulterior motives. She knows that she needs to master the Almond pastry for me. Or not, because I'm sure it will taste wonderful whether she's "mastered" it or not! And, I told her I'd need to borrow the book too. :) Love your adventures in baking... and of course anything you ladies design too! That quilt show looks amazing! So do the croissants. YUMMM-o. I can't wait to see the last AotH piece and the bonus block! I am nearly caught up and loving every stitch. Beautiful croissants! What a fun cooking class that would be. Have you seen It's Complicated with Meryl Streep and Steve Martin? Meryl's character teaches Steve's character how to make croissants. 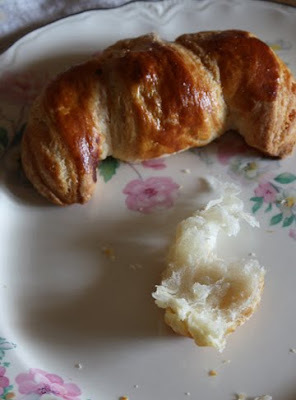 Looking at your croissants, I nearly took a bite out of my monitor. Yummy. They were calorie free, right?? ?